The Freddie Mercury biopic, Bohemian Rhapsody, made me recall many dramas about singers, but for different reasons. I enjoyed this film flaws and all. It didn’t bother me much that Freddie’s decision to pursue a solo career is treated by his fellow band mates with the kind of incredulity that suggests they’ve never heard of John Lennon. It didn’t bother me much that Freddie’s gay friends (and boyfriend) are all painted with the same unsympathetic brush. It didn’t bother me much that the songwriting seems so easy, that hits seem to roll off the practice sessions like magic. All because the music kept coming. Music I knew. Music I grew up with. Music that, combined with nostalgia, reduced me to an emotional puddle. One huge plus can compensate for many smaller minuses. All because the music kept coming. Music I knew. Music I grew up with. Music that, combined with nostalgia, reduced me to an emotional puddle. One huge plus can compensate for many smaller minuses. This brought back so many memories of being a teenager in the 80s. Of being mesmerised by the brilliance and flamboyance of Queen, of Live aid (God knows we were starved for western music on television then, so this extravaganza was like a starving kid being allowed inside a candy shop), I was clapping out loud at the names mentioned, tears flowed down my face at several moments and they were mostly to do with the songs. The performance at the end at my INOX screen was brilliant, I felt I was almost literally there, I screamed out the lyrics and waved hands along with my friend and the audience on screen. It was a little bit like I had actually seen Freddie Mercury perform live. I’m still a little hung over after that experience. Radio gaga is probably my most favourite song ever : an ode to the radio, whose light we actually did spend a lot of teenage nights with. The 80s was when the music video was born, which explains why “we hardly needed to use our ears”, (can’t believe the I want to break free video was banned in the USA for showing cross dressing but that Doordarshan was happily relaying it to us) but the other day, using the bluetooth in my car, while being in musical nirvana, using my daily 1.5 gb net for live streaming a classic country radio station abroad via an app on my phone while driving, I was thinking of how prophetic were the lyrics “You’ve yet to have your finest hour”. I didn’t care the lead was punier or less good looking than the real version,(he compensated with his acting ), I didn’t care they changed reality a bit for making the story better, I didn’t even care if I kept thinking of Littlefinger (what a remarkable voice he has) when the manager came on screen, Bohemian Rhapsody was my best cinematic experience in a long time. For a while there I was again fifteen. It didn’t bother me much that Freddie’s decision to pursue a solo career is treated by his fellow band mates with the kind of incredulity that suggests they’ve never heard of John Lennon. Apparently, that’s one of the liberties the script took with reality. That was actually never a reason for break up. In the film, he essentially breaks up the band when he demands time off to make a solo album. Bohemian Rhapsody’s Queen is outraged by the request. But in fact, Queen drummer Roger Taylor had already released two albums — Fun in Space and Strange Frontier — before Mercury released his first solo record, Mr. Bad Guy. I paid Rs 160 at my multiplex and got to attend a Live aid concert. Paisa vasool. I can’t agree more. Despite the flaws I loved the movie since each and every song held a special memory. Watched it in Sathyam on the first day and I was quite surprised that the audience consisted of equal numbers of people from the older generation and the younger ones. In retrospect it’s not all that surprising considering the timelessness of Queen’s music. I just wished they had explored Freddie Mercury’s relationship with his band mates, Mary Austin and Jim Hutton a bit more. But overall the movie was a goosebumps experience. Especially we will rock you and the whole of live aid concert when my row of college kids joined the singing. Needless to say, I joined too despite the lump in my throat. BR!! I was hoping for a 5000 word in depth analysis of Bohemian Rhapsody, the film or just on Freddie Mercury and his music. You are such a tease giving us mouth – watering tidbits while leaving us wanting more! Have to agree with you about the movie though. Can’t say I was happy with the ‘art’ (or shall we call a spade a spade and say the ‘commercial considerations’ )that went into its making but man the art behind it makes it entirely worthwhile. 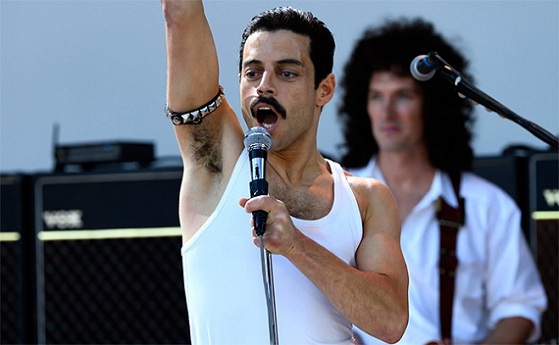 I was in tears through enormous chunks of the movie and unabashedly wept through that brilliant re-enactment of the Live Aid concert when I wasn’t singing along and revelling in the sheer awesomeness of the music. And how good was Rami Malek huh? Can’t disagree with you there but having been unable to get Queen outta my head for a while now, I am thinking that in a strange way this film with all the creative liberties and distortions of facts is nevertheless fitting. After all this is Freddie Mercury we are talking about whose many talents included hiding in plain sight right? I was less than thrilled with the scene where he admits to being bisexual and his better half tells him he he gay (thought that was in bad taste especially since said ‘condition’ is depicted as to blame for the ills that befell him.) But then he never did discuss his sexuality and odds are it was every bit as fluid, evolving and dynamite as his music. In life he defied any attempt to be labelled, why attempt to do so after his passing? As for all that nonsense about Freddie breaking up the band for selfish reasons or the AIDS diagnosis before Live Aid, the makers would have known that no true Queen fan worth his/her salt would know it be untrue. As for the rest, they are also likely to Google up one of those many articles that discuss how true the movie has stayed true to ‘facts’. And since the movie had the green signal from Brian May and Roger Taylor, perhaps they were taking a leaf out of their lead singer’s book and pocketing the moolah with a nod and a wink. Or it is possible I am reading too much into this the way you are sometimes accused of doing. And wherever Freddie is, he is probably laughing his arse off, well pleased over the power his music always will always have over the living. PS: What’s with that John Lennon crack? I am sure the break up of the mighty Beatles came about over a number of complicated reasons. Laying it all on the great man is most unfair Sir! Even if you had been inclined to point fingers why not do the reasonable thing and place the blame sorely at Yoko’s feet? @Anuja, regarding John Lenon, I think BR is saying there was already a precedent for the lead singer of a prominent Band to go solo, for whatever reasons (BR sir hasn’t touched upon that). So, the incredulous look on the Queen members’ faces could have been one or two shades lighter when they heard of Freddie going solo. By the way, I agree with you that the filmmakers would have thought it through before making the factual changes. In fact I really liked some of the changes, especially the revelation of AIDS. Because of that, the Live Aid concert did serve as a catharsis not just towards the band’s unity but also in sealing the image of Freddie as a tragic hero. His devotion towards the music despite the deadly disease coupled with the sensation he put up on the concert was quite overwhelming. And that is why I think the Van Gogh model here might have met the First Man fate – celebrated by critics, rejected by mass audience. And see, the Van Goghs or the E M Forsters anyways attract niche audience. But the Freddie Mercurys and the Neil Armstrongs are almost household names. Their movies deserve to be a celebration. They are supposed to overwhelm us. Cinema halls should be packed when they are screening. Alas, only one of them got the commercial treatment this year. And I understand that BR sir is not asking to tone down the celebration, merely asking to amp up the characterization. But I am satisfied as long as the cult status of the protagonist has been re-enacted.